In this first "beta blog" I'll discuss an IDE feature that's not covered in the first beta video, improvements in code formatting. In this first "beta blog" I'll discuss an IDE feature that's not covered in the first beta video, namely improvements in code formatting . I picked this specific topic not because it it the most important feature of the product, but because it is a tiny gem that I can easily discuss in a blog post. Covering something like the extensive subversion integration in a blog post is quite hard, I have to say. 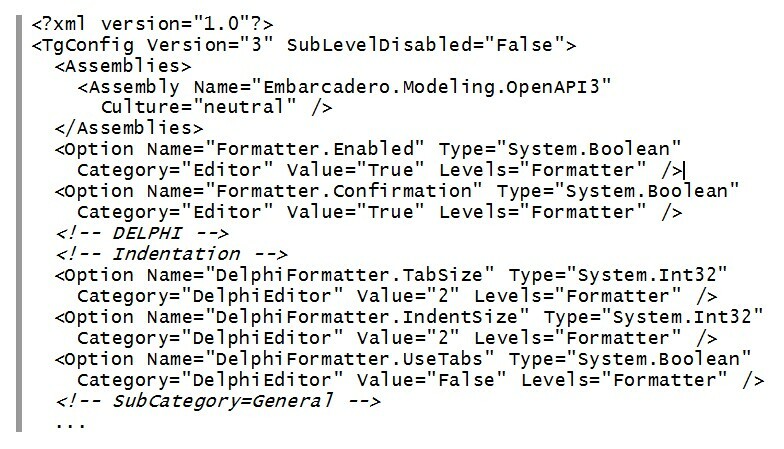 Source code formatting was introduced in the Delphi 2010, but it had a couple of weaknesses that limited its usefulness. First, you could format the selected lines of a unit or a full unit, but not all of the units of a project at once. Second, if you customized the format settings there was no obvious way to copy the settings to another computer or share them with the other members of your team, to keep the source code format consistent. Delphi XE addresses both issues, adding some further formatting options. The first and more obvious change is that you can now use the Project | Format Project Sources menu item or the corresponding entry of the Project Manager local menu (on a project node). As the name implies, this applies the current source format settings to all of the units of the current project, after showing a confirmation dialog. The Formatter | Profiles and Status page of the Options dialog box mentioned in the message box above contains the specified settings and also the option to disable the code formatter, removing the corresponding menu items. That's all for this first post. Will find time for a few more in the coming days and weeks. PS. Before you ask about the overall features of Delphi XE and the potentially missing features, we'll have to wait for the road map update that Product Manager Mike Rozlog said he's close to release in this thread. Until that information becomes public, there is nothing I can comment upon. that is buggy and useless!!!! up my code. The added features make it much nicer. a generic and gratuitous attack). think this was originally announced for this release. outside the IDE are here. The formatter is anything but useless even in D2010. Then I'm a happy camper with this feature!!! I look forward to a video on it. particularilly once you start getting nested logic. I used to format my Delphi begins that way. formatter; the Delphi 2010 version didn't do that well. It helps keeping your units short though. (free) 3rd party plugins work just as well already. I also welcome code formatting as a productivity booster. methods, skinning/templates, database apps, custom controls. I'll keep everyone updated on my blog.